Trump’s candidacy, election, and presidency emboldened a new wave of anti-Muslim conspiracy theorists to run for office nationwide and at all levels of government, trying to capitalize on a deeply false premise: that smearing Muslims is a successful campaign strategy. As Running on Hate will show, it is not. It is a losing strategy. 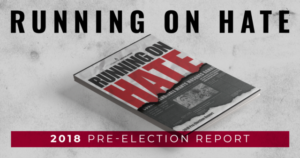 This pre-election report attempts to make sense of this new wave of anti-Muslim conspiracy theorists by documenting their campaigns, their messages, their wins and their losses. It also dives deep into original public opinion research to understand the narrow sliver of the electorate these candidates hope to influence. After the November 2018 election is complete, Muslim Advocates will update this report with the results of the general election and a deeper and fuller look at the records of the longtime antiMuslim conspiracy standard bearers.